It’s No’ Reel Scottish ceilidh band for weddings and events in Glasgow, Edinburgh and throughout Scotland. 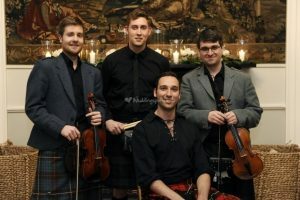 This Scottish ceilidh band is available for weddings, parties, birthdays, and any other celebrations. The band perform tight, exciting sets of good Scottish and Irish tunes, with ceilidh dances which are called by Tom Harold to ensure all your guests dance the night away. One of only a handful of professional ceilidh bands on the circuit, It’s No’ Reel Ceilidh Band is made up of musicians who have studied at some of the UK’s top conservatoires: The Royal Conservatoire of Scotland (formerly RSAMD), The Royal Northern College of Music and Paul McCartney’s Liverpool Institute for Performing Arts. Over the years this band has shared the stage with acts such as Jack Penate, The Klaxons, Edith Bowman, Newton Faulkner and Bombay Bicycle Club. The band’s professional engagements include performing at the 2012/13 BBC Scotland Hogmanay Celebration. It’s No’ Reel also perform traditional tunes in-between dances to give the dancers a break whilst keeping the atmosphere up. Born in Glasgow, Tom is a professional composer by trade, winning the BBC Proms Young Composer of the Year when he was just 16. Tom first started piano lessons aged 7, later studying at the Music School of Douglas Academy in Glasgow (where he first started It’s No’ Reel), and then onto undergraduate and Masters degrees at the Royal Northern College of Music Tom is an exceptionally experienced caller: from parties of Scottish dancers, leading the Hogmanay Ceilidh at Glasgow o2 Academy calling for over 1000 foreign dancers at an open-air gig and everything else in-between, Tom’s done it all and guarantees to make the ceilidh as fun as possible for all ages. Tom is also a Guinness World Record holder! Scott’s drumming career began aged 10 when he was given his first drumkit for Christmas. He initially studied drums and percussion with Lachlan Birch, and after performing with numerous bands and ensembles he continued his studies at Sir Paul McCartney’s Liverpool Institute of Performing Arts Scott has had masterclasses with Mark Ronson, Guy Chambers, Billy Ocean, Natasha Bedingfield and Sir Paul McCartney, to name but a few, and his world-renowned tutors have included Dave Hassell, Luke Flowers, and Peter Fairclough. Scott’s fusion of traditional ceilidh drumming with lots of funky moments is guaranteed to keep your guests on their feet the whole night.